Burton caught three passes for 18 yards in Chicago's 24-10 win over the Jets. Analysis: The Jets were well-prepared for the typical middle screens in which Burton specializes, and other than converting an 18-yard reception, his other catches resulted in him being tackled at the line of scrimmage. He's only had two games this season in which he's failed to produce as a top-12 tight end, which is impressive because he's been targeted more than five times just once over his last six contests, and he'll continue to be a strong weekly fantasy option. Burton caught nine passes for 126 yards and a touchdown in Chicago's 38-31 loss to the Patriots. 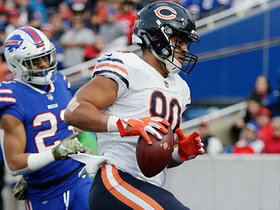 Burton hauled in two of four passes for 86 yards and a touchdown in the Bears' 48-10 win over the Buccaneers on Sunday. 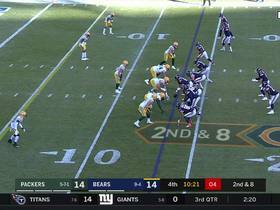 Analysis: Burton got the Bears' offensive explosion started with a 39-yard first-quarter touchdown in which he got loose down the right sideline for his second score of the season. The fifth-year pro still hasn't topped six targets in any game, but he's proven to be a serviceable downfield threat thus far in what had been a cautious Chicago air attack prior to Sunday. Burton will look to continue producing against the Dolphins in a Week 6 showdown following a Week 5 bye. 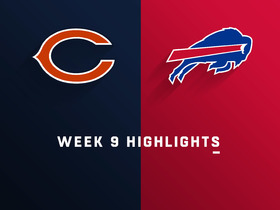 Burton caught four passes for 55 yards in Chicago's Week 3 victory over Arizona. 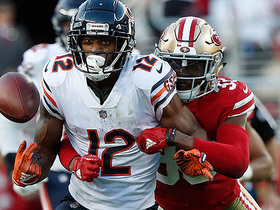 Analysis: Burton saw the majority of his work in the first half while the Bears were playing with a 14-point deficit, and once they got back into the game they rarely threw the football. Although his yardage totals have improved each week, he's averaging just 30 yards per game with one touchdown, and although he's clearly a decent fantasy option, he's yet to prove that he'll be a top performer at tight end. Burton caught all four of his targets for 20 yards and a touchdown in Monday night's 24-17 win over the Seahawks. 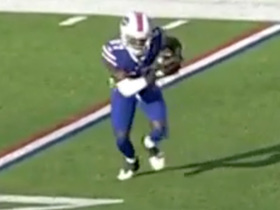 Analysis: Burton capped Chicago's opening offensive series with a three-yard touchdown from a well-designed shuffle pass. Although he wasn't very involved afterward -- and tied for third on the team in targets -- he at least caught everything thrown his way, an improvement from his one reception on six targets Week 1. On the back of that performance, Burton will look to keep moving in the right direction this Sunday versus the Cardinals. Burton caught one pass for 15 yards in Sunday's 24-23 loss to the Packers. 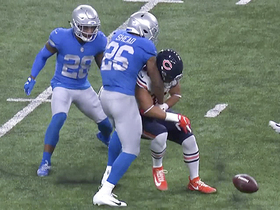 Analysis: Burton's unimpressive performance wasn't due to lack of opportunity, as he was second on the team with six targets, and he might have seen even more opportunities had the Bears not played conservatively after rolling to a 17-0 lead. 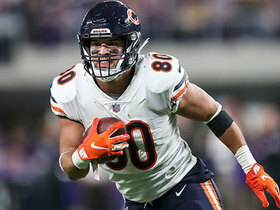 He'll still be considered a fantasy starter going forward, especially since head coach Matt Nagy is certain to make regular use of the tight end position. Burton won't play in Saturday's preseason game versus the Chiefs, Kevin Fishbain of The Athletic Chicago reports. 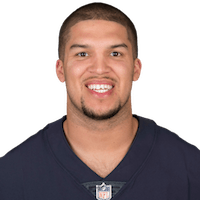 Analysis: Along with the bulk of the Bears' starting units, Burton won't take the field in preseason Week 3. His receiving ability was on full display in the team's previous exhibition Aug. 18, when he corralled four passes for 45 yards and a red-zone look that resulted in a touchdown. The usage wasn't much of a surprise due to the four-year, $32 million investment made in him in the offseason. Burton caught four passes for 45 yards and a score during Saturday's preseason game against the Broncos. Burton caught his lone target for a five-yard gain during Thursday's 30-27 loss to Cincinnati. 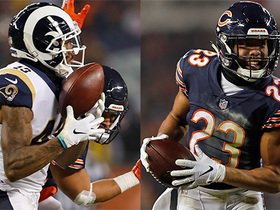 Burton will play the "U" position in Bears head coach Matt Nagy's offensive scheme, filling the spot Travis Kelce occupied in Kansas City last season, Adam Jahns of the Chicago Sun-Times reports. 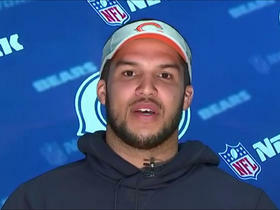 Burton will sign a four-year, $32 million contract with the Bears when free agency opens Wednesday, Ian Rapoport of NFL Network reports. Burton has a number of serious suitors, including the Lions, Mike Garafolo of NFL Network reports. Burton threw a one-yard touchdown pass in Sunday's 41-33 win over the Patriots in the Super Bowl, and failed to reel in the only pass thrown his way. Burton hauled in both of his targets for 15 yards and a touchdown in Sunday's 34-29 win over the Giants. 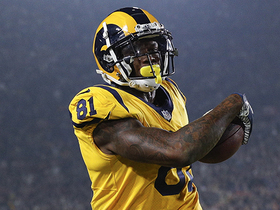 Burton caught five of six targets for 71 yards and two touchdowns during Sunday's 43-35 win over the Rams. Burton caught four of seven pass attempts for 42 yards in Sunday night's loss to Seattle. Analysis: Burton accumulated all of his stats once Zach Ertz left the contest late in the third quarter due to a concussion. While Brent Celek played two more snaps than Burton's 21, the 26-year-old saw all of the tight end targets after the starter's injury. If Ertz is forced to miss time, Burton would stand to benefit in Week 14 against the Rams. Burton (back) was a full participant at Wednesday's practice. Analysis: Burton was a game-time decision for Sunday's 31-3 win over the Bears and ultimately was held out. His return to practice Wednesday as a full participant suggests he'll be back for Sunday's game in Seattle, where he figures to get most of his work on special teams. Burton has proven to be a capable pass catcher when pushed into action, but his skill set is redundant when Zach Ertz is healthy. Burton (back) is inactive for Sunday's contest against the Bears, Dave Zangaro of NBC Sports Philadelphia reports. Analysis: Burton's inability to practice Thursday or Friday left him a game-time decision, and a back injury will indeed keep the tight end in street clothes Week 12. Even when available to the offense, though, he's the third banana at tight end behind Zach Ertz and Brent Celek. Burton (back) wasn't spotted at Friday's practice and is expected to be a game-time decision Sunday against the Bears, Dave Zangaro of NBC Sports Philadelphia reports. Burton was a limited participant in Wednesday's practice due to a back injury. Analysis: Burton ranked third among Eagles tight ends in offensive snaps (13) in the team's Week 11 win over the Cowboys, with Zach Ertz (60) and Brent Celek (23) both seeing more action. It appears Burton's back may have presented complications despite the light workload, though his participation in practice Wednesday still makes it likely he'll be good to go for Sunday's matchup with the Bears. Burton caught two of four pass-attempts for 41 yards and a touchdown in Sunday's win over the Broncos. Burton is expected to take on a larger role in the Eagles' passing attack with Zach Ertz (hamstring) sidelined Sunday against the Broncos, Zach Berman of The Inquirer reports. Analysis: Ertz will likely be replaced in the starting lineup by 32-year-old tight end Brent Celek, but the latter's waning pass-catching chops don't lend themselves to marks in the box score. Meanwhile, Burton has gathered in nine of 10 passes on just 21.8 percent of Philadelphia's offensive snaps this season. Elevated usage could translate versus a Broncos defense that has given up 8.7 YPT and four touchdowns to tight ends across seven outings to date.